So, guess what? I wrote a book! No, for real... I did! 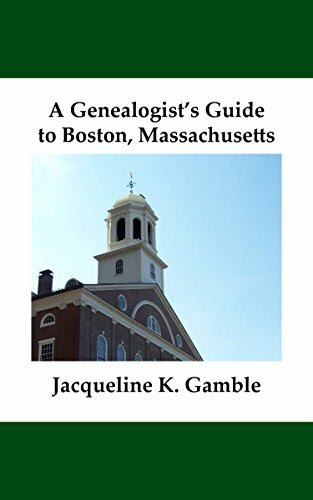 A Genealogist's guide to Boston, Massachusetts is now on sale through Amazon, Creatspace, and The In-Depth Genealogist. 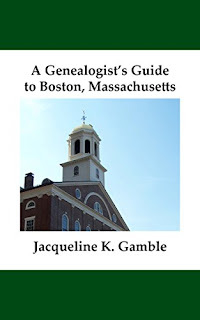 "A Genealogist's Guide to Boston, Massachusetts" is a great resource for genealogists who plan on researching in this geographic area. Approximately 12 million people from all over the world visit Boston every year to take in its beautiful harbor, amazing history, museums, sporting events, and more. With its mixture of old buildings (some dating back to the 1600s), new skyscrapers, and everything in between, Boston truly is a meeting of past, present and future. Whether you are traveling alone, with an adult companion or with your children, you will find plenty to keep you entertained during your stay. Boston is home to well-known attractions such as the Museum of Science, New England Aquarium, Fenway Park and the Boston Duck Tours. History lovers and genealogists will want to visit Bunker Hill, the USS Constitution, Paul Revere's House, the Old Granary Burying Ground and other historical landmarks along the famed Freedom Trail. Of course, Boston is also home to the New England Historic Genealogical Society and other excellent research institutions. This guide will provide you with what you will need to know when planning a genealogy trip to Boston. We will look at repositories, libraries, historical societies, cemeteries, attractions, accommodations, and more in and around Boston. While it includes a lot of information it does not include information on traveling to the city or on places to stay while there. Those decisions vary too much based on a person's budget and travel times to be able to include adequate information. (Description credited to The In-Depth Genealogist). I had am amazing visit with my dad yesterday. I purchased some KFC (his fave) and headed to his house to interview him about his time spent in the Army. The entire visit lasted about 3 hours, but left me with some wonderful stories and memories to pass down to my descendants. At first dad wasn't too keen on being interviewed, and was adamant that he could not remember much about his Army days. However, when I got there he pulled out a binder filled with old Army records (a binder I didn't even know he had). In it were dates of his enlistment, discharge, and time spent on active duty both Hawaii and Guam. Of course, this binder is a real genealogy goldmine. He offered to let me borrow it so I can scan the documents into my computer. Next we pulled out two photo albums filled with photos he took from his time in basic training at Fort Dix, NJ, AIT at Fort Polk, LA, and duty Hawaii and Guam. I have looked through the albums many times since I was a kid, but I had never had my father tell me the stories behind the photos. He told me about his friends, who they were, where they lived, fun times they had, etc. He had photos of a '67 Ford Galaxy he purchased in Hawaii that he later crashed while driving to Honolulu one night. 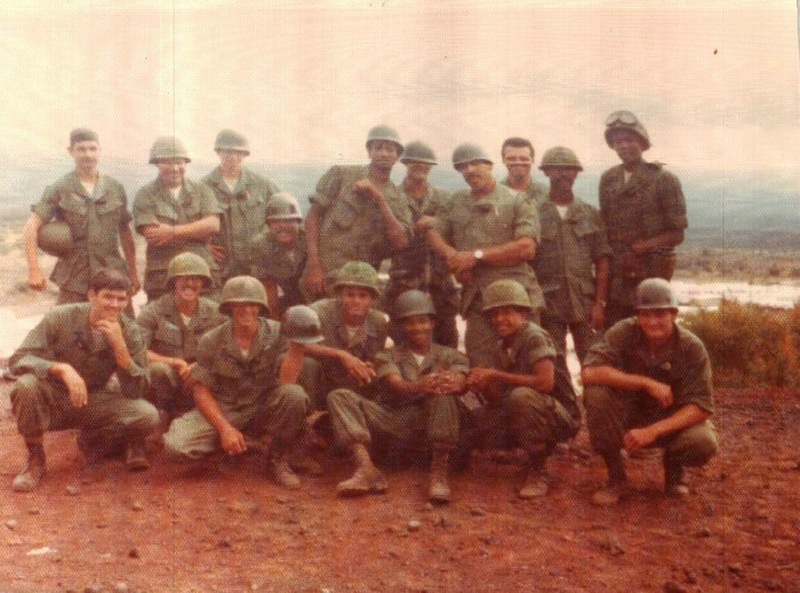 There were photos of concerts he saw (including Merle Haggard, Sammy Davis Jr., and Dolly Parton), the Tent City he stayed in while helping Vietnamese refugees in Guam in 1975, and this photo of his entire platoon that he asked me to blow up into an 8x10 (my dad is in the back at the far left, holding his helmet under his arm). Next my father pulled out a few old letters he has that some of his Army friends wrote him soon after he returned home. They weren't long, but shared a few stories of trouble the caused together, dreams they had for when they were all out of the Army, and some more insight into what life was like for my dad in those dads. When we were done talking about his Army days, dad continued by telling me stories of his childhood. He told me about his pet raccoons (hie brothers also had a pet fox and skunk), childhood friends and trouble they got into together, and other random things as he remembered them. It was a wonderful time with my dad, and I am so glad we did this! I highly recommend everyone does this with their relatives while they still can. I know very little of my 6th great grandfather, Phineas Holcomb. He was born in Simsbury, Hartford, Connecticut on 04 Feb 1726 to Ensign Joshua Holcomb and Mary Hoskins. At some point, Phineas moved from Connecticut to Dutchess County, New York. I'm not sure why, when or who with. I do have information that suggests he married Sarah Tuller in 1745 in Litchfield County, CT. It is possible he had some of his children while still in Connecticut, as well. He and his "large family" left Dutchess County, NY for Panton, Addison, Vermont during the spring of 1774. In 1778, Phineas Holcomb and his sons Joseph, Joshua, Samuel and Elisha were captured by Indians and brought to Quebec. Phineas died during his imprisonment in Quebec on 11 September 1781. Joseph Holcomb was born about 1726, probably in Dutchess County, NY. He died on 20 January 1833 in Panton, Vermont. For more information on the Holcomb family's capture by Indians, please see my blog post entitled Carleton's Raid and the Capture of the Holcomb Family. About a year ago I posted a call out for help about one of my most elusive lines: the Cote's. 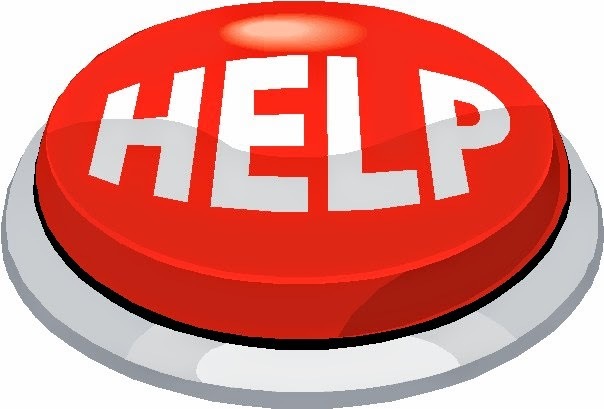 In hopes of rekindling this post and getting some help, I am re-blogging it. Please read the original post at http://genealogyvt.blogspot.com/2014/01/hunting-elusive-cote.html. Thank you! There are five brand new Vermont genealogy groups on Facebook. If you have genealogy research in one or more of the following counties, please consider joining! (I created all but the Caledonia County page - that one was started by a fellow genealogist and was the inspiration for the rest). I don't have many Godfrey's in my tree, but I figured I would list the ones I do have in the even that I can locate a distant cousin or some unknown information. Richard Godfrey (my 9th great grandfather) was born in Lancaster, England in 1631. His father was Richard Godfrey, who was born born in Wales in 1600. The younger Richard came to Massachusetts in 1652. According to a NEGHS publication, he "settled in a part of Tauton called Squawbetty...near the old [iron] forge, now Raynham." He married Jane Turner in 1650 in Weymouth, Massachusetts. Jane was the daughter of John and Jane Turner. Richard died in Taunton, Massachusetts on 16 Oct 1691. Located near the homestead of Richard Godfrey. *I am also curious as to who Wealthy Godfrey is. She was born to Joshua Godfrey and died on 18 Nov 1793. Were they of the same Godfrey family as Richard? 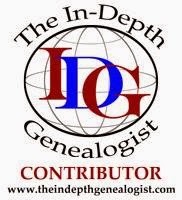 About seven months ago I posted about the family of Cornelius Baker & Almira (Thomas) Ingalls and their descendants. This had been a huge brick wall in my genealogy for many years, but a few nights ago I came upon a record that would lead me back to my 10th great grandparents, Francis Baker and Isabel Twining. I was able to conclude that Cornelius was born out of wed-lock and the Baker surname was his mother, Caroline's, maiden name. I have not found any record that lists his father (though I plan to visit the town clerk in Johnson, Vermont soon to see if I can find a birth record with his name on it there). Once I realized that Caroline's maiden name was Baker, I was able to do some searching and find her parents, and from there my brick wall came crashing down! John Baker was born on 1 May 1645 in Yarmouth. He married Alice Pierce in 1672 in Yarmouth. The only child I have (so far) for John & Alice is their son, Jonathon Baker. Jonathan Baker was born on 31 May 1672 in Yarmouth. He married Hannah Jones on 13 Apr 1699 in Yarmouth. They had at least one son, Lot Baker. For information about Cornelius and his descendants, see my original post, Baker Family of Lamoille County, Vermont.